Absolute beachfront, fully equipped beach house. Our fantastic holiday home is right at the end of Pourerere Beach, the last house in the whole settlement. The beach is just meters from the house, with uninterrupted views north, east and south. 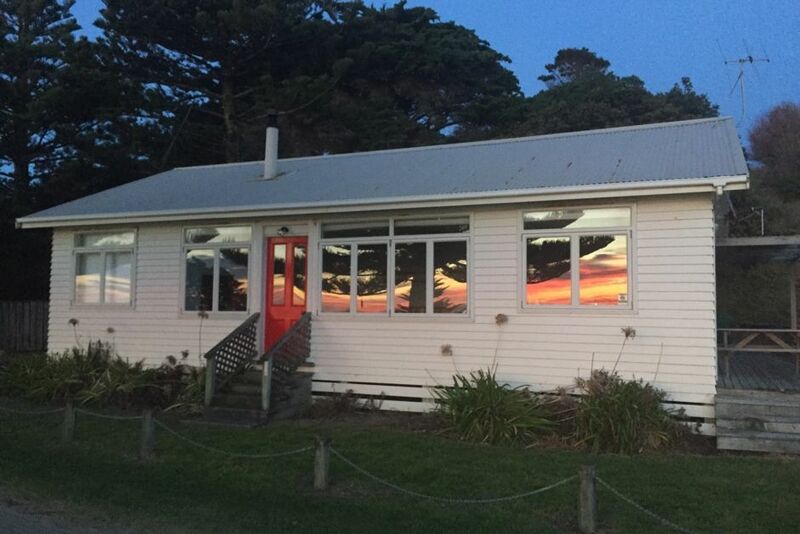 Surrounded by Department of Conservation land and bordering the Te Angi Angi Marine Reserve. Just metres from our place is a stunning coastal walkway, rich in diverse marine and bird life, as well as great swimming (safe for all ages) and surf. There's something for everyone here. The large open plan living space and large, top quality kitchen, easily accommodates extended family and friends for fun and relaxing holiday adventures. Everything you need for a fantastic time is at your fingertips. Extremely well appointed with the best beds, bedding, furniture and appliances - from the best iPod dock and stereo, to goose and down duvets. You could not be more comfortable. High quality Egyptian cotton linen available for a small additional cost, if required. Large laundry, new bathroom, hot and cold outdoor shower. Sun trapped deck and paved courtyard with outdoor dining setting for 10. Even an outdoor heater for added comfort. This is a place to really get away - no cellphone, no shop. You can relax from the minute you arrive. It's our special place of peace and paradise and we'd love to share it with you. Smoking allowed outside only please. As always the bach is just perfect! All the modern necessities mixed with bach life! Beautiful beach and even in the stormy weather there is plenty to entertain everyone inside the bach. We will be back for sure! Beautiful beach and perfect Bach. Beautiful beach and perfect Bach. Would love to visit again. The bach has an amazing location, at the end of the road, overlooking a wide rocky reef, with colliding waves. The bach itself is well looked after, tidy and with all mod cons, mixing in retro and beach styles. Maria was fantastic to deal with and we loved staying there. Maria was fantastic to deal with and we loved staying there. Would highly recommend her.